9 RAR arrived in South Vietnam in November 1968 and during the Battalion’s tour of active service it took part in twelve operations covering four provinces. After a period of familiarization 9 RAR commenced Operation King Hit One, a cordon and search of the village of An Nhut on the road between Baria and Dat Do. The result was one enemy killed, several Viet Cung (VC) suspects detained and quantities of weapons, equipment and medical supplies were found. The Battalion deployed on a reconnaissance in force operation Barossa north of Nui Dat. 9 RAR’s task was to locale base camps of C41 (Chau Duc) District Company that harassed Ngai Giao. Binh Ba and Ap Suoi Nai. ‘B’ Company moved out of Nui Dat by road escorted by tanks and armoured personnel carriers (APC) and with Engineers in support to clear Route 2 and to secure a ‘fly-in’ area for the remainder of the Battalion. In ‘mine alley’ near Ap Suoi Nai, one APC struck a mine resulting in one officer and one soldier wounded but remained on duty. Companies operated effectively in separate AO’s ambushing and locating enemy stores. ‘A’ Company had the first success by ambushing 10 VC. In another ambush, 6 Platoon ‘B’ Company killed the second in command of the Chau Duc Company. ‘D’ Company located a large complex of camps which was destroyed by the unit’s Assault Pioneers. The operation concluded on Christmas Eve 1968. On 1st January 1969 the Battalion deployed on Operation Goodwood which was a 1st Australian Task Force (1 ATF) reconnaissance-in-force operation into likely enemy base area east of Saigon. 9 RAR relieved 1 RAR in AO Wondai – the operation was characterised by short savage contacts against the VC in well-sited bunker complexes and Main Force enemy units. On 10th January ‘A’ Company attacked a large bunker system and a battle raged for three and a half hours with fire support provided by mortars, artillery, light fire teams and close air support. At one stage, 1 and 2 Platoon attacked with fixed bayonets. On l6th January a reported sighting of 40 enemy in a camp in the centre of the AO resulted in ‘C’ Company moving by air into this area. The company could not reach the area until just on last light and set up a night ambush position. At 2320 hours, enemy came into the ambush which sprung by 8 Platoon and among the enemy killed was a North Vietnamese Army (NVA) officer. Next morning when the company entered the deserted bunker system, it found enemy killed by artillery. Unbeknown, 9 RAR had prevented the passage of an NVA Regiment from south to north. All rifle companies and ‘Support’ Company were in action against the enemy on 19th January. The AO was extended on 29th January westward 10 include Route 15 and the fire support patrol base (FSPB) was relocated to AO Jenny in two hours to support the redeployment by air. Two days later 9 RAR returned to AO Wondai until 17th February. The operation was successful in regard to enemy killed and bunker systems, supplies, ammunition and camps destroyed. The frequency and the fierceness of the contacts resulted in thirteen men of 9 RAR being killed in this operation. Operation Federal saw the Battalion deploy into BienHoaProvince as part of a plan to ensure the protection of Saigon, Bien Hoa Air Base and the Logistic Support Base at Long Binh. 9 RAR, less ‘B’ Company moved to AO Arunda and occupied company defensive positions. ‘B’ Company was placed under command of 1 ATF as part of a ready reaction force against possible VC TET offensive actions in PhoucTuyProvince. Operations in AO Arunda were markedly different from operations in AO Wondai as there was no deep jungle and patrol areas were basically open rice paddy/grassland with low yet dominant hillocks. On 23rd February ‘C’ Company confirmed that enemy were moving into the AO when it attacked and captured a bunker system. Meanwhile in Phone Tuy Province ‘B’ Company Group Mobile’ with tanks, APC’s and mortars patrolled around Baria and Long Dien to deter an expected enemy attack. On 23rd February the VC rocketed Baria and attacked targets in Baria, Long Dien and Hoa Long. ‘B’ Company’s counterattack was successful in routing the enemy. 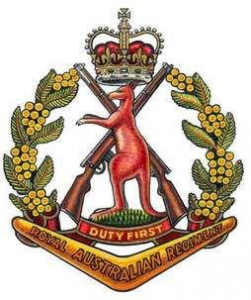 On 5th March, 9 RAR with ‘B’ and ‘C’ Companies redeployed to AO Burrendong south of 1Route in order to search for signs of enemy units of 5th Division. A mini FSB Maria was set tip with a section of guns of 161 New Zealand Field Battery and three US Army 155mm Self Propelled (SP) guns. On 7th March ‘C’ Company came in heavy contact with a large bunker system. ‘B’ Company also found an occupied bunker system and airstrikes and artillery supported the companies assault. The enemy withdrew and left behind many documents which identified the unit as an NVA Rocket Regiment. Having being relieved by 5 RAR, 9 RAR returned to Nui Dat having been on continuous operations from 1st January, to 10th March 1969. Operation Overland covered LongKhanhProvince and extended once again into BienHoiProvince. The Battalion operated around FSPB Wattle between Route 2 and the Binh Son Rubber Estate. AO Goulburn included a major enemy base camp area and again 9 RAR fought through extensive bunker systems. On 3rd April all companies except ‘C’ Company were in contact with the enemy. Three days later ‘C’ Company located a huge complex of 98 bunkers including a hospital area but it was unoccupied. A ‘caretaker’ VC group returned next day and a short sharp firefight ensued. During this phase of the operation ‘A’ and ‘B’ Companies had very heavy contacts. Much time was spent in destroying the bunker systems and rendering them useless with non-lethal gas which would persist up to six months. On 11th April the Battalion moved south west to AO Picton on a food denial mission. After deployment to FSPB Juanita companies moved to ambush in their AO’s in which ‘B’ and C’ Companies had contacts. ‘C’ Company located a cache of two tonnes of rice and ‘A’ Company located film, broadcasting and printing equipment, paper and material for flags. On 16th April the Battalion commenced Operation Surfside east of Nui Dat in the vicinity of Dat Do and Xuyen Moc. 9 RAR operated in the ‘Light and Long Green’ against the enemy’s district units. Initially all companies flew into unsecured landing zones (LZ) and moved to blocking positions. There were obvious signs that the enemy had departed the area quickly. After extensive patrolling and some light contacts, the Battalion returned to Nut Dat on 23rd April. In mid 1969 a major change in strategy for the conduct of the war occurred with greater emphasis being placed on pacification operations. 9 RAR was deployed on Operation Reynella to assist with population security in the Long Dien and Dat Do Districts and to protect land-clearing operations. The Battalion, less ‘C’ Company which deployed to the Horseshoe feature to train 2/48 Armed Republic of Vietnam (ARVN) Battalion, occupied AO Aldgate and patrolled and ambushed to interdict enemy moving between the Long Hai hills and the populated centres in the area. On 15th May province officials reported that an enemy company had infiltrated into Dat Do and 9 RAR reacted by placing a cordon of company localities around the town. The task of clearing Dat Do was left to regional and popular forces but no enemy were located. The Battalion returned to Nui Dat on 15th June. Operation Matthew took the Battalion to north of Nui Dat in an area bounded by Route 2 and the Courtney rubber Estate. The deployment by road and air was completed with Battalion HQ at FSPB Flinders. There were only minor contacts in this operation. The Battalion extended its area of operation necessitating the establishment of a second FSPB. The Battalion on 18th July moved by air to undertake Operation hat Dich to locate and destroy enemy Main Force elements in the area. On 19 July ‘C’ Company came into heavy contact fighting in a bunker system resulting in many enemy casualties. 274 VC Regiment had returned to the area and the Battalion operations had severely interrupted its activities. 9 RAR returned to Nui Dat on 31st July having destroyed large quantities of the enemy’s redeveloped assets. Operation Neppabunna involved both pacification and reconnaissance-in-force. ‘B’ Company moved to secure FSPB Serle and later protect land clearing teams in the Long Green. On 31st August the centre of operations moved to FSPB Wells near Xuyen Moc. This operation was a complex one with companies undertaking many different type tasks. The Battalion was relieved by 5 RAR on 15th September. Operation Jack was the last major operation for 9 RAR in Vietnam. It involved land clearing protection and reconnaissance-in-force over large tracts of land in the Hat Dich area. During the operation there were many light contacts with the enemy and a quantity of caches were located and destroyed. The Battalion returned to Nui Dat on 31st October and 1st November 1969. Having been relieved by 8 RAR the Battalion departed South Vietnam on 28th November 1969 to return home to Adelaide where the unit received a rousing reception. Awards to 9 RAR for this period included one DSO, two MCs, seven MMs and eight MIDs. On 31st October 1973 9 RAR was linked with 8 RAR to form the new battalion 8/9 RAR.